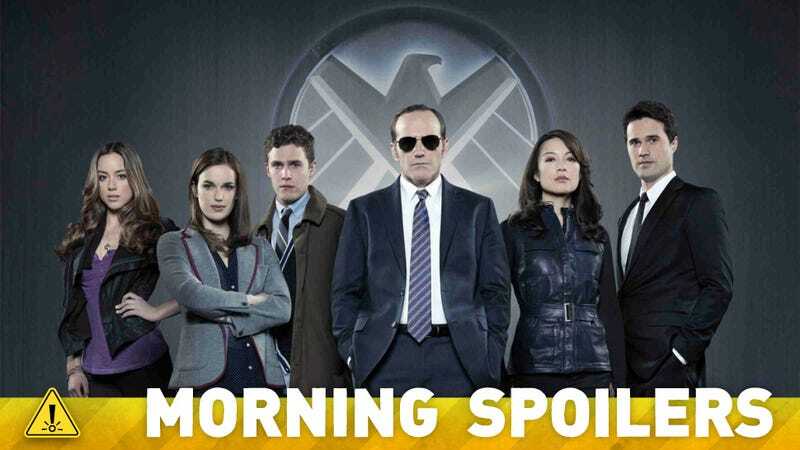 Which Iron Man Villain Wants to Reappear on Agents of S.H.I.E.L.D.? How will Jurassic Park 4 relate to the first three? Plus did we just learn the truth about John Hurt's role in the Doctor Who 50th Anniversary special? There's new viral marketing for Elysium and Ender's Game, plus new Pacific Rim posters. Spoilers ahead! We don't want to create a new scoop here, but we definitely want to honor what came before us. There was a gap between Paul McGann playing the Doctor and Christopher Eccleston, when we didn’t see a regeneration, and John Hurt will fit into that gap. He is a past Doctor, not a future Doctor. You can’t watch the same person make the same relationship mistakes over and over again without at some point expecting that they’re going to learn from what’s happened and eventually have to close some doors. In the case of both Bill and Eric, they’re people that she legitimately has incredibly strong feelings for, and it’s really quite painful to realize that you actually need to walk away. There can also be something very empowering about that. Well, she’s never been with another faerie. She’s always been with other supernatural creatures that ultimately they're different species end up being problematic in various ways. This is the first one of her own kind that she’s ever been with or met. The first time she ever hears or sees him she’s kind of like, “Oh, God, no! Got to keep walking, got to go to work. Not again.” But there is something actually alluring about feeling like maybe this person might actually understand you. There's definitely potential there. First, they point out that Rick Grimes and Daryl Dixon are taking center stage in this season's poster, where last year's featured the whole cast. Also highlighted here are Michonne and Tyreese. This may indicate who AMC has "put its faith in." Tyreese swinging his hammer also indicates a particular scene from the books may be making its way to TV this season. Finally, it looks like this season will see the return to prominence of the flesh eaters. Reports are saying that Caroline may be tempted by an upperclassman she meets at Whitmore College. The upperclassman is Jesse, one of three recurring characters introduced in the premiere. Jesse is a human with "reasons to hate members of the undead." Megan will attend the Mystic Falls High School 1950s dance and get close to Jeremy. Are you relieved that they didn't kill Justin Hammer off, since it appears that was the original plan, according to recently released storyboards?Because you can come back, perhaps on Marvel's Agents of S.H.I.E.L.D., with your pal Clark Gregg? Ah! I was hoping to come back in one of the Avengers films and come after Gwyneth Paltrow, because that's what they set up, that I was going to get revenge on Gwyneth for getting me arrested or something. I could do a Cape Fear thing with Gwyneth. But they've got a lot of mojo in there already, so I don't know if they need another pirate like me in the mix there! [Laughs.] Maybe S.H.I.E.L.D. is the way to go.